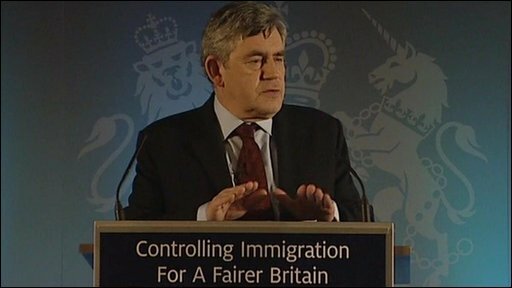 Gordon Brown: "The debate is about controlling immigration for a fairer Britain"
Prime Minister Gordon Brown has stepped up his pre-election rhetoric on immigration by telling would-be illegal migrants: "You are not welcome." Mr Brown said there had been a significant drop in asylum claims and net immigration thanks to Labour's "tough and hard-headed" policy. But he warned against scaremongering and urged a "united front" among the main parties to combat xenophobia. The Tories said Mr Brown had "failed on immigration" and had no new ideas. Net immigration - the difference between those entering and leaving the country - has gone up from 47,500 when Labour came to power in 1997 to 163,000 in 2008, according to the Office for National Statistics. The Conservatives say they want to get it back down to mid-1990s levels - with the aid of an annual cap on work permits issued to people from outside the EU through the points-based migration system. They would also stop students transferring automatically from study to work, introduce a border force to combat illegal immigration and an English language test for the spouses of legal migrants. But they would encourage more high value migrants such as entrepreneurs, doctors and scientists to come to the UK. Labour says including an annual cap in the points-based system would be too inflexible and would damage companies needed to get Britain out of recession. In his speech, Gordon Brown said the number of skilled workers being admitted from outside the EU was already falling as more British workers are trained up to meet skills shortages. He said chefs and care workers were the latest types of workers to be banned from entering the UK from outside the EU, although aides stressed this would not come into full force until 2014 and would only cut numbers by about 2,500. Mr Brown also used his speech to stress the importance of addressing voters' concerns about the impact of immigration on their communities. And he delivered a stark message to illegal migrants: "To those migrants who think they can get away without making a contribution; without respecting our way of life; without honouring the values that make Britain what it is - I have only one message - you are not welcome." But Mr Brown sought to differentiate between the position of parties such as the BNP and UKIP and "mainstream parties" who he said share a consensus that immigration is a positive force in British society and a necessary contributor to economic growth. He told the audience "how we conduct this debate is as important as the debate itself". And he called on mainstream parties to unite against "those who want to end immigration not because of the pressures it places on our communities but simply because they don't like migrants". Giving his reaction to Mr Brown's speech, Conservative leader David Cameron said: "I'm delighted that the prime minister has converted to the cause of controlled migration, but people will wonder what he has been doing for the last few years." Liberal Democrat home affairs spokesman Chris Huhne said there was "more consensus than meets the eye" on immigration and that "after many years of chronic mismanagement Labour have now got their act together". But he said a border force, with police powers, was needed and he called for the reintroduction of exit and entry checks. The Lib Dems favour a policy of earned citizenship for illegal immigrants - dubbed an "amnesty" by their opponents. They also say they would channel skilled migrant workers to parts of the country where there are labour shortages, away from the overcrowded South-East of England. The big three parties are facing a general election challenge in some parts of the country from the UK Independence Party and the British National Party - both want to withdraw from the EU and introduce far tougher immigration policies. The BNP wants want an immediate end to all immigration to the UK, including from other EU countries, and a programme of "voluntary repatriation". UKIP wants a five-year freeze on immigration for permanent settlement and work permits for EU citizens. The party's leader in Brussels, Nigel Farage, told BBC Radio 4's The World at One Labour has "lost control" of immigration but the UK would continue to have an "open door" while it was a member of the EU. If industries needed certain skilled workers they would be given "a time specific work permit" but not the right to "settle in this country, bring their family and to contribute to what is now the most overcrowded country in Europe," said Mr Farage.